For a while now, we’ve had a ‘Recent activity’ page (on the web only) for seeing info about expenses you’re involved with. Additions, edits and deletions have been logged here, as well as payments. We’ve transformed the ‘Recent activity’ view into a full blown feed, and we’ve brought it to mobile (launched on Android as of today, iPhone update is submitted and under review right now). The Feed will log info about groups and friendships you’ve been added to, when someone turns simplify debts on/off in a group you’re in, and when someone makes a comment on an expense involving you. 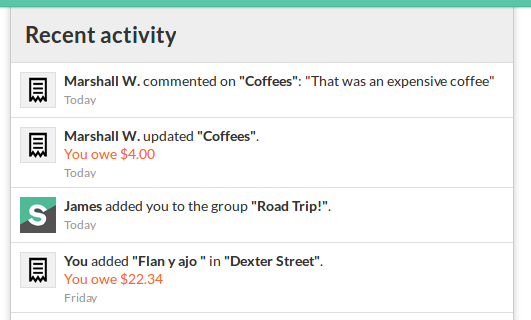 In December we added expense comments, so users could make comments on individual expenses (“Why did this bill get higher?”). Now, system comments will show up in the same section, showing you the details of any edits made to the expense amount/split/etc. Don’t worry about expense updates made by someone else; now you know when something got changed, and what the changes were. The same events that will now generate entries in the ‘Recent activity’ feed (added to group, simplify debts toggled etc.) will also generate push notifications for mobile users. These pushes will be more ‘intelligent’ than before; if someone adds you to a group, for example, you’ll get a push notification to that effect, and tapping the push will take you directly to the group screen in the app.